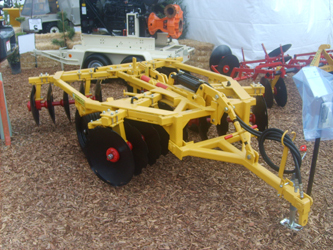 Specifications: blades 22" or 24" notched or smooth edge, 9" cast iron spools, 1 1/2" square plow steel gang rods, 5000 lb. rated wheel hubs, double sealed wheel hubs, slip-in wheel spindles with wear sleeves, 7.60 x 15 6-ply tires on 15 x 6 6-bolt wheels, 12 to 28 degree gang angling, 3" x 12" hydraulic lift cylinder, hose guide and center shank, 4" x 4" tubular frame construction. Sizes: 6'6" to 9'7". Weights: 2520 to 2933 pounds. Options: blade cleaners, lateral gang adjustment, dirt deflectors, rear utility hitch, drag brackets, toolbar brackets, clevis type tongue, hitch jack and hydraulic hose kit. Features: a heavier version of the VTL with larger frame tubing and heavier gang components. For the farmer that has heavy soil conditions that are considered above normal and requires higher horse power tractors.